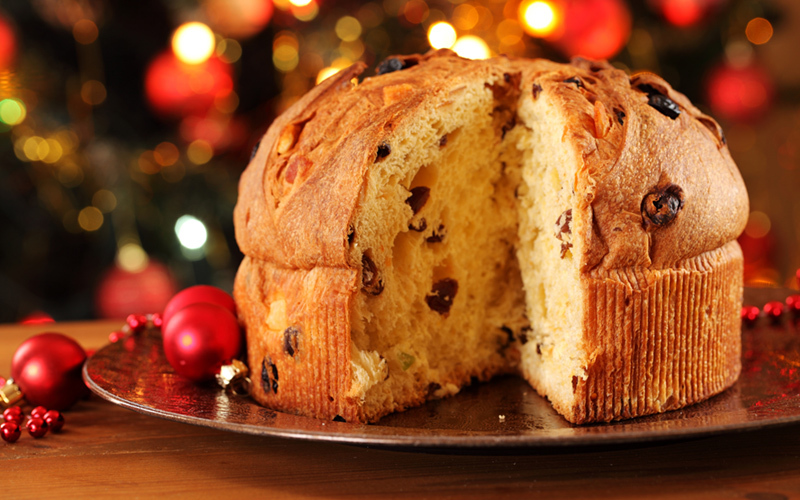 Panettone and Pandoro are two staples in every Italian household during the Christmas season. The two recipes are similar but differ in the density of the dough and addition of fillings. If you ask most Italians, they will have a preference for one or the other, but all will agree it’s not Christmas without these sweet breads. Panettone dates back as far as the Middle Ages, when people would replace their daily bread with a richer recipe to celebrate Christmas. 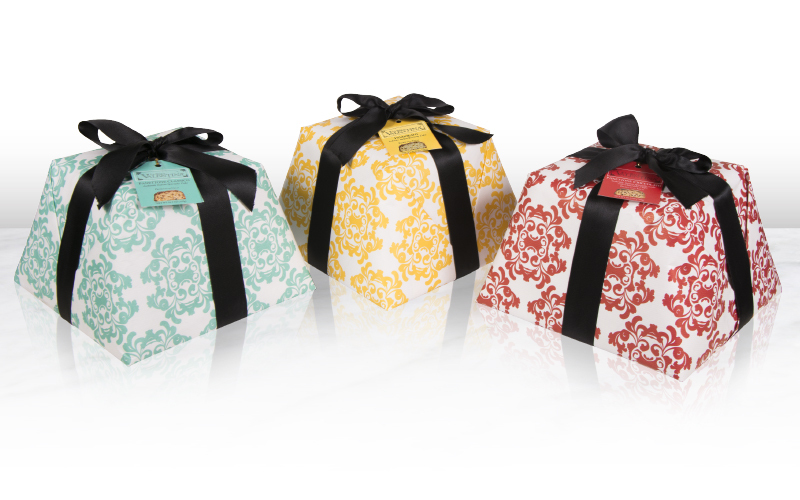 There are many tales to relate the origin story of panettone but the most popular legend revolves around a love story. The tale says a noble falconer fell in love with the daughter of a baker whose business had begun to crumble. The falconer’s family did not approve of the relationship because of the financial status of the baker’s family. To help improve the business, the falconer purchased butter and sugar to add to the bakery’s regular bread mix and with these additions, the new treat became the most popular thing the bakery had ever produced. After the bakery’s business boomed due to the popularity of the sweet bread, the falconer’s family finally approved and gave the lovers permission to marry. 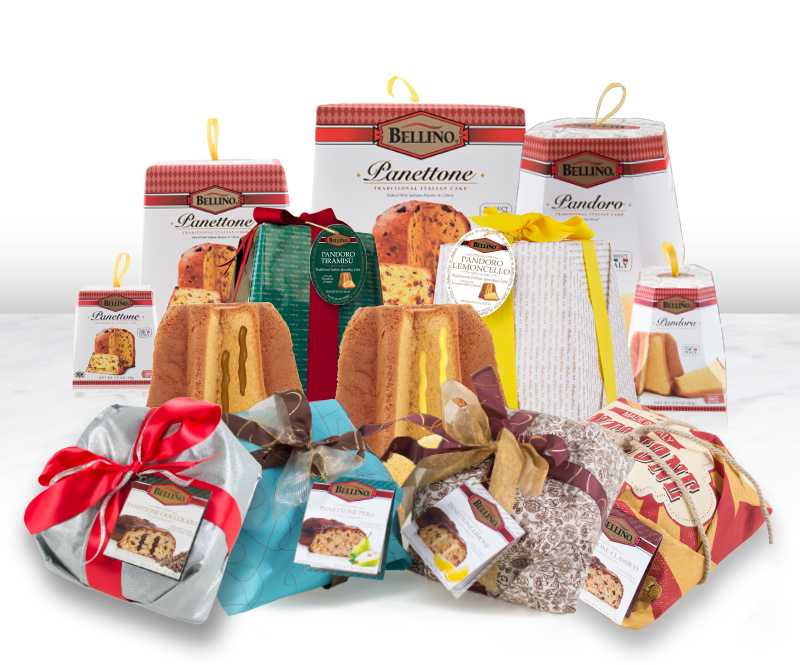 Originating in Milan, panettone is traditionally a cylindrical shape with a domed top. 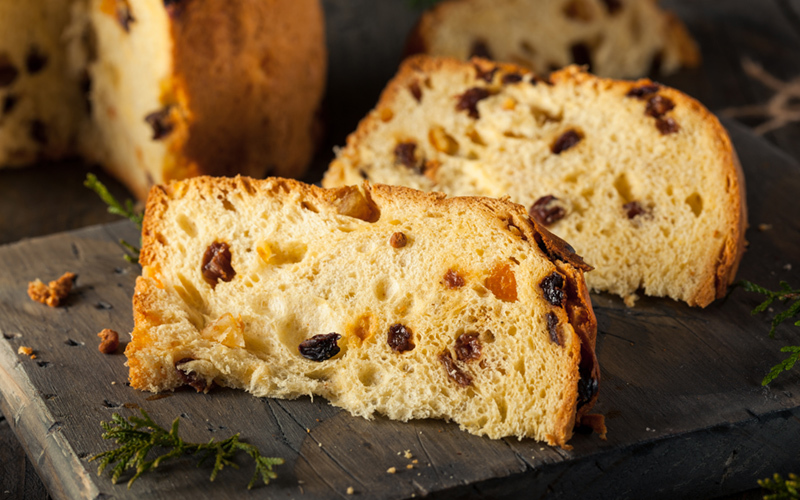 This sweet bread loaf stuffed with raisins and candied fruits is often gifted to hosts by visitors during holiday gatherings. According to old Milan tradition, if you save a piece of your Christmas Panettone and eat it on February 3rd, the Feast Day of San Biagio, you won’t get a sore throat for the rest of the year. 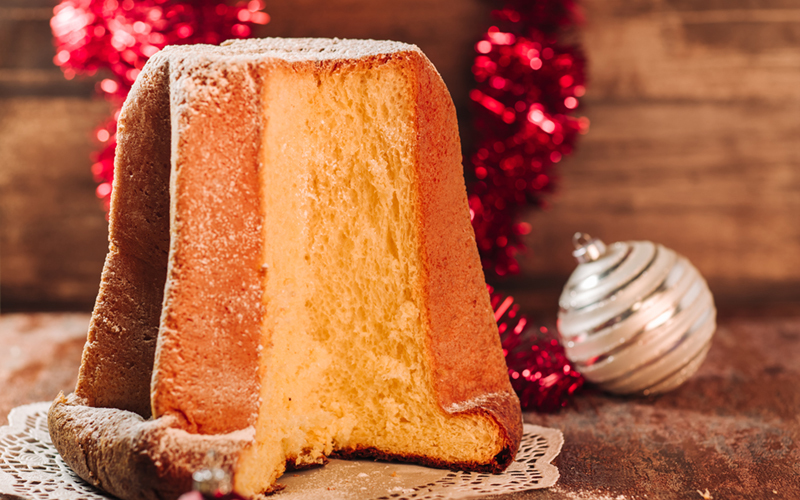 While panettone originated in Milan, pandoro is a pound cake variation of the sweet bread that originated in Verona. There is much debate about the origins of pandoro and some believe it dates back to ancient Roman times, but the most modern pandoro recipes are based on 18th and 19th century versions of the bread made for rich Venetians. When panettone became a favorite treat first in Milan then the rest of Italy, a pastry chef named Domenico Melegatti from Verona wanted to improve the recipe, making it softer and lighter. He increased the amount of butter and eggs in Panettone and on October 30, 1894, Melegatti obtained a patent for a technique to be applied in producing pandoro industrially. 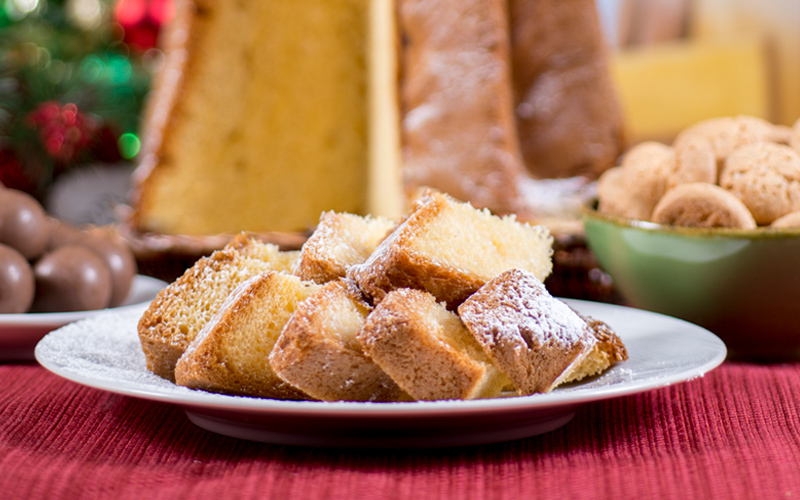 A traditionally star-shaped cake dusted with powdered sugar, pandoro (pan d’oro) means “golden bread” and true to its name, pandoro has a bright yellow color that comes from the eggs in the recipe. 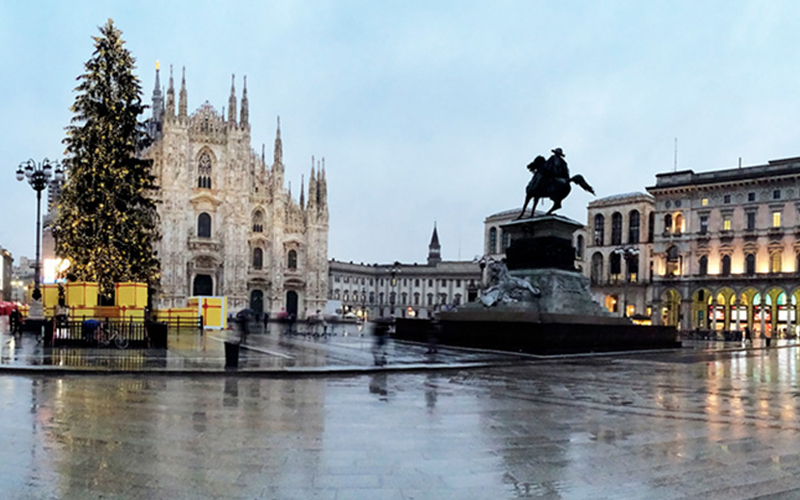 Powdered sugar sprinkled on top gives the appearance of the snowy peaks of the Italian Alps during the holidays. Both delicious on their own, these cakes are versatile and can be served with coffee for a breakfast or afternoon treat, or with a sweet wine, berries, chocolate, whipped cream or ice cream for dessert. Leftover pieces can be transformed into bread pudding or French toast to be enjoyed as an after-holiday treat. Bellino D’Oro Classico Panettone: A classic Milanese recipe in an artisanal low-rise panettone style and adorned with candied fruits. Bellino D’Oro Cioccolato Panettone: An artisanal low-rise panettone style cake filled with chocolate cream, dipped in chocolate and coated in chocolate flakes. Bellino D’Oro Limone Panettone: An artisanal low-rise panettone style cake filled with a lemon cream and pieces of candied lemon. Bellino D’Oro Pera Panettone: An artisanal low-rise panettone style cake filled with candied pear and rich chocolate chips. Bellino Pandoro: A tall, star-shaped pound cake that is topped with powdered sugar to resemble the Italian Alps during the holiday season. Bellino D’Oro Tiramisu Cream Filled Pandoro: Hand-wrapped in elegant packaging, This sweet, golden cake is topped with powdered sugar and filled with a tiramisu cream. Bellino D’Oro Lemoncello Cream Filled Pandoro: Hand-wrapped in elegant packaging, This sweet, golden cake is topped with powdered sugar and filled with a lemoncello cream. 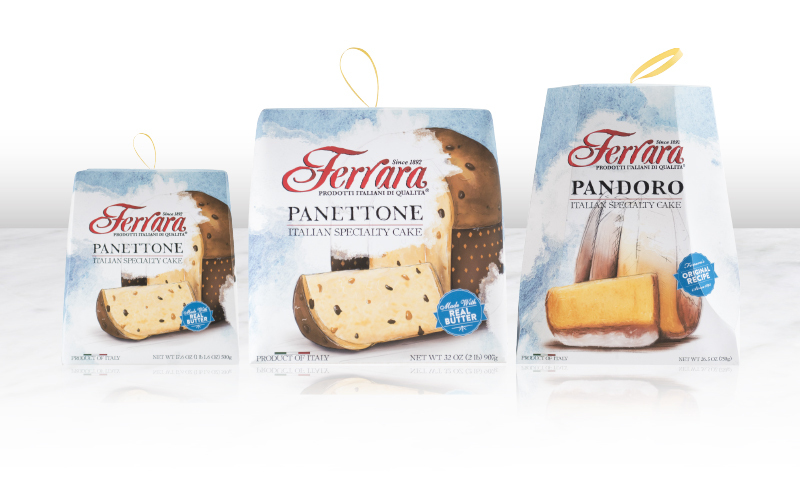 Ferrara Rustica Pandoro: A star-shaped pound cake, bright yellow in color, and sprinkled with powdered sugar to resemble the Italian Alps during the holidays. Ferrara Traditional Panettone: A classic Milanese recipe panettone baked with real butter. Contains candied fruits and raisins throughout the cake. La Bella Valentina Panettone Classico: A classic Milanese recipe panettone baked in an artisanal low-rise style with fruits and raisins. La Bella Valentina Pandorato: A "flattened Pandoro" baked without the addition of fruit or raisins and covered in a delicate icing. La Bella Valentina Panettone Ciococlato: An artisanal low-rise panettone style cake containing chocolate chips.